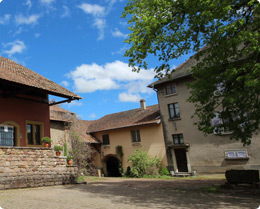 It is difficult to date the start of winemaking at the Château d’Orschwihr. In the XVI th century there are reports about vineyards owned by the Château; But there were vines in the area since Roman times and winemaking is probably as old as the building itself. Our family bought the place around 1854. At that time it was surrouned by a moat with a stone bridge for access. They filled the western moat by destroying the western wall and erected a building for horses and cows, pigs and poultry, hay storage, in short it became a typical farm producing all the neccesities of live, wheat, vegetables, milk, and a bit of wine of course. In 1950 , the vineyard covered one hectare and the wine was sold on the local market. The next generation, Martin Hartmann, started making wine professionally. He was quite successful and got several Gold Medals for his wines in Paris. The vineyard area increased from 1 to 6,5 ha, mainly by planting plots of land on the Bollenberg and of course the cellar had to be extended. This was done by building an undergroud storage for bottles under the courtyard.in 1971. Interestingly, there was no Riesling vineyard at that time. The first Riesling was planted on a plot of the Pfingstberg that was purchased and reclaimed in the seventies. It consisted of small terraces separated by dry stone walls on a steep part of the Pfingstberg. 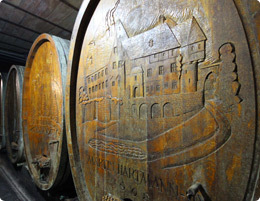 Hubert Hartmann took over in 1986 and set on expanding both the vineyards and the cellars. In 1987 the stables for horses and cows, at that time empty, were converted in a cellar with underground storage to allow more rartional work. The first plots on the Enchenberg were purchased in 1989, reclaimed in 1990 and started planting. This buying, reclaiming and planting has been completed only in 2009, turning the Enchenberg into a Monopole. The grapes are Riesling and Pinot Gris. Other areas have been bought around Vieux Tahnn, the Gesetz, the Hueben, bringing the total there to 12 ha. Around Orschwihr the same policy lead to buying into the Kitterlé, the Kessler and the Zinnkoepflé and other plots of vineyard, bringing the area around Orschwihr to 13 ha. A new cellar had to be built in 2001 on the same levels, (underground and ground level) to house the new tanks and barrels and the increasing amount of bottles.